The United States Congress designated the Big Rocks Wilderness (map) in 2004 and it now has a total of 12,930 acres. 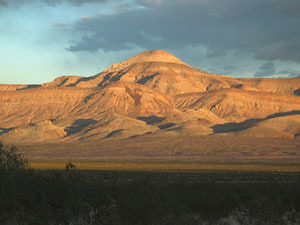 All of this wilderness is located in Nevada and is managed by the Bureau of Land Management. The Big Rocks Wilderness lies to the north of the South Pahroc Range Wilderness and encompasses the southernmost portion of the North Pahroc Range. The topography of the area includes steep-sided mountains, several canyons and a section of large, jumbled boulders known as Mecca by the rock-climbing community. Elevations, here, range from 5,200 to 7,000 feet. Vegetation ranges from desert brush and grass at the lower elevations to pinyon and juniper stands at the middle and upper elevations. Many common desert species can be seen in this area, however the most notable would be the raptors. The area is composed of large boulder fields and varying colored layers of welded tuff that have weathered into unusual rock formations. This area is rich in rock art and primitive campsites. Planning to Visit the Big Rocks Wilderness? How to follow the seven standard Leave No Trace principles differs in different parts of the country (desert vs. Rocky Mountains). Click on any of the principles listed below to learn more about how they apply in the Big Rocks Wilderness.